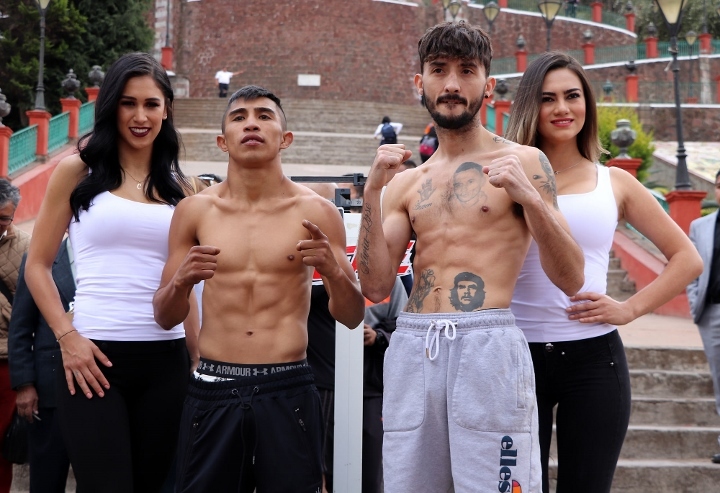 With a great physical work and a winning mentality, Mexico's Julio César Martínez and British contender Andrew Selby made weight and reported in excellent condition to enter the ring this Saturday, in the Metepec Fairground, to define who will be the official challenger to the WBC world championship at flyweight. The staircase of Cerro del Calvario was the attractive setting for the medical examination and weigh-in ceremony, where after making the official weight, the protagonists posed face to face, and it was notorious the advantage that Selby will have in stature and reach, so Martinez he will have to have the talent and the ability to impose the fight at short range and force the exchange of blows. Mauricio Lara 130 lbs - Guillermo Ávila 131 lbs. Jaky Calvo 112 lbs - Gabriela Sánchez 110.6 lbs. Kevin Montiel 136 lbs - Pedro Bernal 136 lbs. Should be a good scrap.